A video that name call "How to Increase Your Wi-Fi Signal" is popular on Youtube. The guy shows you how to use cellphone to increase wi-fi signal. Does it interesting? I have never test it, but I read Wong's blog, who wrote a blog that talk about his test result. 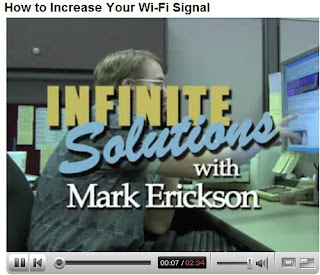 I also watched some smart idea videos from Mark Erickson who is an Infinitesolutions guy.